Your success in manifesting your desires isn't in re-programming your thoughts. It's in the energy behind your thoughts. And the most important energy is the energy within your heart. It is so important that it is the Secret of the Law of Attraction. …heart energy propels you forward to your goals. It's like your life is overflowing with miracles. It's easy to connect to heart energy. It’s so easy you've probably done it before without realizing it. All you have to do is feel the Universe's love for you. The Universe is constantly trying to let you know it loves you. Just be willing to listen. As you feel the Universe's love, simply love it back. It's this feeling of love that will let you know you have connected with your heart energy. If you're having trouble feeling the Universe's love for you, begin by telling the Universe how much you love it. Let it know all the reasons why you love it. Allow the energy to increase of its own accord. Feel it within you and all around you. Almost immediately you'll feel energized as you connect with your heart energy. Once you are connected to your heart energy, begin thinking about what you would like to manifest. Describe it to the Universe, expressing gratitude as if you had already received your desire. 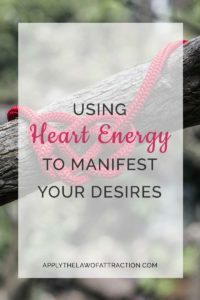 You can even picture your desire and imagine it entering your heart where the energy is the strongest. When you're done, just let it all go. You might still feel energized (note: this is a great afternoon pick-me-up), but you can let it go whenever you feel ready. …and you will discover it is the secret to success with the Law of Attraction. I find activating my heart energy a little exhausting- so I’m not sure if I’m meant to feel this way. It shouldn’t be exhausting. Instead, you should feel more energized and centered. It’s possible you’re trying to hard to make it happen. If you’re really thinking hard about what you’re doing, you’re using mind energy. Instead, you want to focus in on your heart and allow yourself to feel the energy there. Focus on that energy spreading throughout your body. Isn’t focusing on my heart energy expanding using mind energy? When I relax to feel my heart energy, I believe I can feel it but it’s not strong. I feel calmer and relaxed but it isn’t what you describe above. I really want to feel like I’m truly radiating/ energized by the strong love of the universe, so can you tell me how to intensify that energy in my heart? Thanks in advance, your website is wonderful. That’s a good question about using mind energy. Expanding heart energy is a sensation, a feeling of the energy in your heart growing and expanding outwards. It’s like a warmth spreading throughout and around the body. When first learning to work with heart energy, it’s natural to use the mind to try to manipulate heart energy, to make it expand. As you become more adept at using heart energy, you’ll find that you can connect directly to it just by focusing on that area of your body, allowing it to come forward in your senses, so to speak… It is a completely separate energy from mind energy, but we’re so used to using mind energy that at first the only way we know how to tap into heart energy is with the mind. In time, it’s easy to to see the two energies as separate and to work with them separately. However, the most powerful part of the law of attraction comes from using both energies together – mind energy for your thoughts, visualizing, etc, and then the more powerful heart energy to supercharge a manifestation. The more you act from heart energy and use it…the more you feel it throughout your body even during such simple tasks as feeling it flowing through your hands as you write…the more you’ll find that it’s heart energy that is empowering your actions and energizing you. When you feel tired or need a “pick-me-up,” really connecting into heart energy and feeling it flowing through every cell of your body will give you the energized and centered feeling I was discussing. P.S. I’m glad you like the site! Feeling liberated and as if worry has disappeared is wonderful! That’s a sign that you’ve tapped into heart energy. It naturally raises your vibration and releases resistance, allowing you to manifest your desires more easily. Keep up the good work! Thank you I love your ebook on manifesting love and thank you I will be sure y report back. Giving out love to everyone has changed not only my life but those who have received the love. I’m so glad heart energy has had such an affect on your life! It makes such a profound difference. It’s why I call it the secret to the Law of Attraction. Thank you for sharing! Hello. This is really great information. I just recently began reading about unconditional love and the power of being in the state of unconditional love. I would like to ask what Harry asked. He said something like he would truly like to radiate and be energized by the universe’s love and asked about what ways he can intensify energy from the heart. I would like to hear if you have any suggestions. Thanks for all the great information!! Love and light! Hi Chris, It’s great that you’re working on unconditional love. As I explained to Harry, intensifying heart energy comes from practice. The more you use it, the more you begin to know what heart energy feels like and how it works. As you become more adept at expanding your heart energy field, the more you will be able to increase its intensity. You have to start with learning how to tap into heart energy and keeping it expanded before you can work on more advanced techniques like intensification. can heart energy can touch someone in a different part of the country right? of course…because we are one, right? Hi Tiffany – Heart energy can touch someone in a different part of the country. It can touch anyone, anywhere. Thanks you thank you thank you for responding! So, it would take a long time to harness heart energy strong enough to touch someone across the country? Is it like training my heart energy to radiate 10 ft, 20 ft, 400 ft and then eventually 1500 ft from me ? Does that make sense? Hi Tiffany – You already have the ability to touch someone across the country with heart energy. It’s just a matter of deciding to do it and it’s done. You can start just playing with heart energy – feeling it, expanding it around your body and bringing it back in, pushing it out to fill a room. The more you get used to using heart energy, the more you will recognize how it feels and gain more control over it, but even now you can send it wherever you want. I feel like there is something like an energy sword that goes from my back through my heart and ends in my chest but I can’t find an answer to that feeling! Do you have any idea what could it be? You have two options you could consider: 1) Who is stabbing you in the back? 2) If it’s a positive feeling, then ride the wave. I connected to heart energy last week Weds to Satuday. All I would do was focus on my heart, feel it expanding energy outward across my body, feel love (gratitude!) for the universe for various reasons (nature, protection, family, friends, wealth, health etc) . In turn, I would get this AMAZING feeling spreading through my body just lighting me up. I felt like I was floating. Like I was invincible. I imagined myself as recieving my wish. A perfect beach body. I imagined and felt my body in my perfect shape- no joke, literally next morning I was feeling and looking much better! But now I just can’t connect to this feeling. It’s mad. Before I did effortlessly and was losing weight. Now it’s just not happening. Could it be I over did it? I really want to get back onto this. It was out of this world. You didn’t do anything wrong. You could just be trying too hard right now. You’ve shifted your alignment and need to relax. Find something that makes you happy and just allow it to happen. Don’t force it. Also make sure you don’t have any resistance or limiting beliefs about your body. I learned how to expand my heart energy from reading your book about relationships. Wrapping your thoughts in love, see the love touching the person and such. For years I sing songs in my mind that I make up, dealing with love. Pretty much every sentence of my silly-songs have the word love. After reading your book and the posts on heart energy, I realized that my little songs that I sing to myself, all love filled, are expanding my heart energy. Which explains to me why I always feel much love while I am singing them and after. As a result I have found it easy to send out my heart energy, and feel it coming back. I do the rays differently though. I make energy heart shaped as it flows from me to the other person. I love the feeling! It is so wonderful! Wonderful Rose! Using songs is a brilliant idea! I love a person but he is not talking to me since 1 year.Tried a lot to talk to him but in vain..I even trief to forget him but ended up thinking about him more and desperately want to talk to him..please help me to know whether he thinks about me. The things I want involve my spouse. He and I have been living apart while he completes medical school. We have faced a major bump in the road recently. I visualize him starting his residency where we will be located closer to each other, and our daughter and I can drive to see him every weekend. I want to believe a miracle could happen, but could it? I am a firm believer in the law of attraction, but I am not certain my husband is constantly following this. Can my love of the universe and visualize that I have what I want (involving him and our life) help…even if he is not 100% on the “law of attraction” bandwagon? You are the sole creator of your reality. There is no such thing as a miracle with the Law of Attraction. It’s as easy to create a parking space as it is to win the lottery. It all comes down to your beliefs. Instead of wanting to believe a miracle could happen, why not believe that you are close to your husband and can see him every weekend? Be open to different ways that this can happen – everything from his residency being close to you to you moving closer to him. What if something better than you currently are imagining could happen? Thank you so much for your response. I am definitely going to follow your advice. You are a wonderful person for taking the time to respond to all of us. Incase u r gonna ask, I am healing from my trauma with reiki and another mehod. I know that energy blockages hold me back from manifesting, but maybe I can manifest bwfore my healing is “complete”. I want to try anyway. You don’t have to send him heart energy if you don’t want to. If you want to try it, you can send it to his higher self rather than the person he is on this planet. When you’re ready, heart energy can be a powerful way to move past bad events and memories, and let go of trauma. Surrounding yourself with heart energy helps many people shift residual anger, fear, guilt, or self-blame. If I do not send my abuser heart energy, does this mean that I cannot send heart energy to my love in order to be one with my intention and manifest a relationship with him? This question may sound weird to u but, it is really about how heart energy works. For example, if someone experienced a traumatic tsunami and is angry about that but has healed enough to not take it out on “the universe” and feels good when they think about heart energy, can they still use heart energy or do they have to be like “the tsunami was good, because everything is good and the universe loves me”…? I have been feeling lately that although my trauma is so terrifying and brought me to the scariest places imaginable, I *still* think that ultimately, my love is a lot stronger than any of that! You can still connect with heart energy and sent it to your love. haha!!! Thank god!!! Lol. I had an instinct that was the case, but some of the descriptions of heart energy made it sound like one needed to be some sort of Nelson Mandela saint (he welcomed his captors into his home) in order to use Heart Energy, lol. Wow, the universe truly does love us, only if we let it. I met my love, because the Universe loves me. How can we deny our desires when we think like that? I am reading your book and am grateful I found this site. Love it by the way!! I am working on the heart energy, expanding it and such. Sometimes I feel it, sometimes I don’t. I have been wrapping thoughts in love such as I love this or I love that the way you describe in your book. Even though I am new at it, I have been imagining my heart energy flowing to my love. I have been doing this a few times a day and sometimes I feel a warm loving feeling coming back to me. It feels great! But once I stop sending the “rays” out, the feeling stops. Is that what you mean by someone answering your heart energy back? Thank you for your help. Thanks Great! What you described is a way someone can answer your heart energy. hi eli …. i am from india ….plzz say how can i get your book …hard copy …and how much it costs ?? A hard copy version is not available in India at this time. As I said previously, my book is only available in India here: Manifesting Love. I was searching for some info over the net regarding heart energy and came across your blog. I sometimes get a very strange intense feeling in my heart chakra, near the center of the two lung. I don’t know how to explain it but it feels too strong and intense love. It normally lasts for an hour or two. I cant think or focus on anything else when it happens. I just feel like sitting quiet and feeling it. I dont know what is it and why its happening. Is it my heart energy? It sounds like it may be heart energy. Hi Elizabeth. I’ve been practicing this technique for about a week now and I think i’m getting success. I am getting compliments from people and people are using manners more around me. But i’d like you to verify something. I think i’m feeling heart energy right now. I feel a pulsing feeling through my heart, and the more I type this the more I feel it. I feel like I can feel a heat energy literally flow through my body, starting from the center and instantly reaching my arms. I’m also listening to music in the background, which also intensifies it somehow. Do you think this is heart energy?